Hey, everyone! The weather is trying to convince us that summer is ending but we’re just not having it! We still get bouts of great, sunny weather from time to time so lets make the most of it. I’ve noticed a lot of Motocross riders making the most of it as well lately, getting in all the rides they can while the weather is half decent. So I thought I would do another blog on some MX gear, something I’m still trying to work toward doing a bit more of. But I know we’ve got some great gear coming in with the next season of Oneal stuff so I thought I’d talk a bit about that. As always the Oneal Motocross gear looks awesome but, striking colours of these cool kits aside, what surprised me about them was the prices on some of these kits. Oneal are a well known brand in the world of MXing and their designer price tags usually reflect that status. 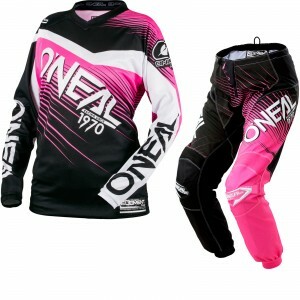 But this season, particularly in the Oneal Element 2018 Motocross Kits, the price tag is really affordable at an entry-friendly £124.90 to £130.90. 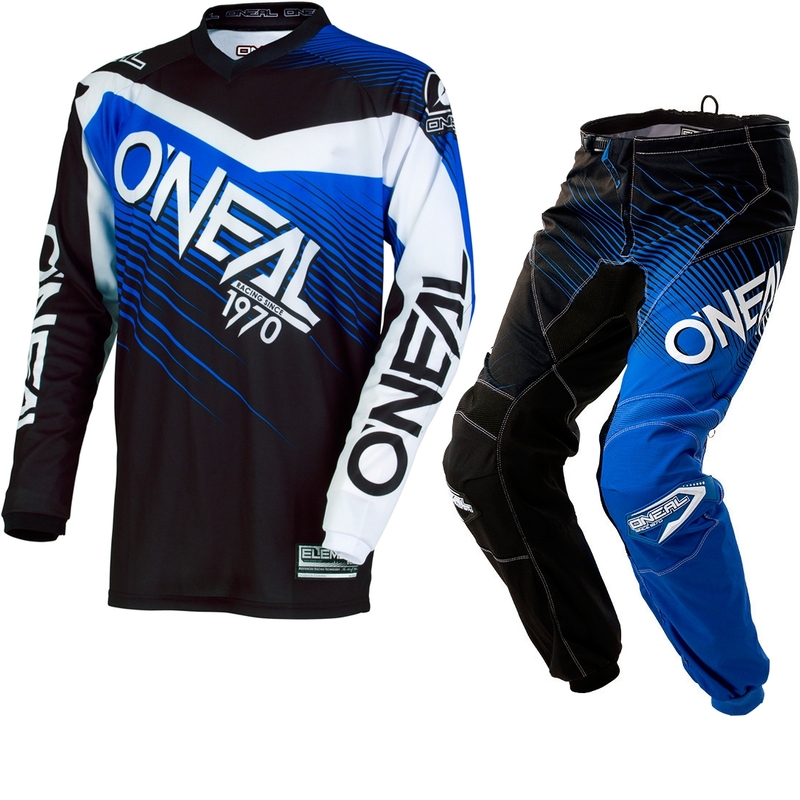 For as low as £124.90 you can get a kit from Oneal that’s fit for the pros. The construction of the kits are heavy duty, yet also light weight, so it won’t weigh you down and enable you to perform to your best. The jerseys are made from a light material that breathes exceptionally well, is moisture wicking to help keep you comfortable and has sewn-in elbow padding. 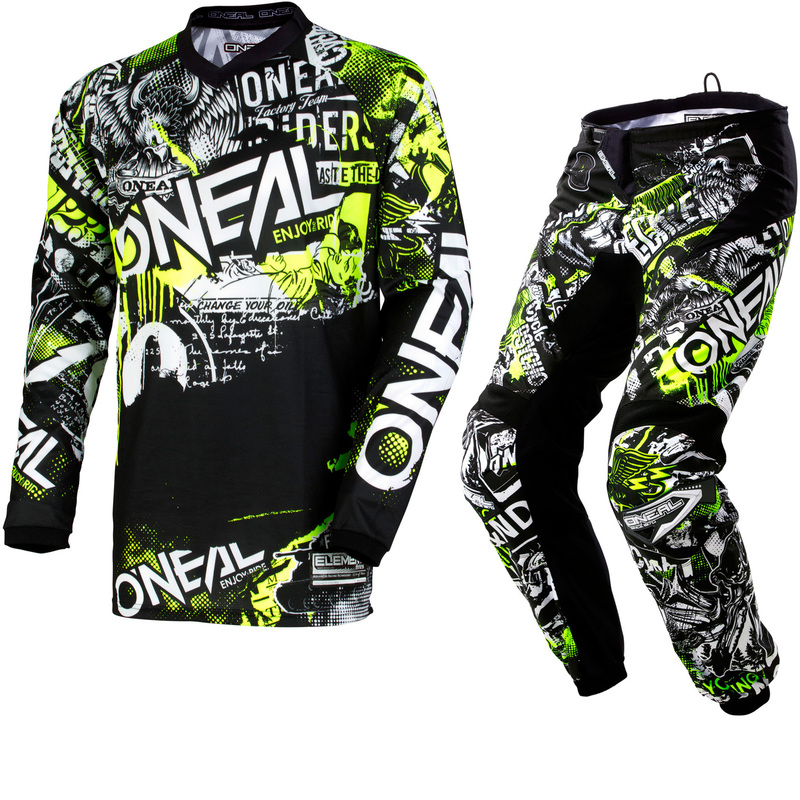 Oneal expect you to get good and mucky in their gear too, so the sublimated no-fade graphics will hold up against both the environment they’re ridden through and the washes to get any “environment” off that you’ve taken home with you. The pants are made of a heavy duty but lightweight fabric so that it can stand up to the scuffs and rough treatment of MX riding, you’ve even got extra-durable, wear resistant panels on the seat of the pants, the inside of the legs and the knees- some of the most hardwearing areas on MX pants. They’ve even taken comfort in mind, with everything from stretch panels in key points to give you the best freedom of movement. There are also lightweight, breathable panels in areas that are positioned away from being in contact with the bike for the best ventilation results. There are some rubber areas for a bit of extra protection in a crash, they’re fully lined to keep you comfortable and there are even EVA foam hip protectors that can be removed and reinstalled as desired. The legs of the pants are tapered with elastic cuffs for a great fit and making tucking the cuffs into boots a bit more comfortable. 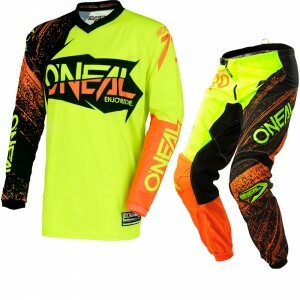 At £124.90 to £133.90 there are plenty of really cool kits to choose from. With all the different 2018 Element kits, including all the colours and even a ladies kit in pink, there are 11 kits to choose from. Some of the kits are even available in junior sizes too, so your little MXers don’t have to miss out on a new season of really cool kits and fantastic value for money! Don’t forget to pick up a matching pair of Oneal Element 2018 Motocross Gloves too! They’re just £21.49 and the gloves have kids sizes too!